Generic Engine Monitor (GEM) CANtrak displays transmitted J1939 and J1587 engine and transmission data, active and stored alarms where supported, plus is a trip and fuel computer. The GEM application runs on the renowned CANtrak 7200/7210 robust industrial graphical displays. The GEM offers user selectable icon based display layouts as well as including a comprehensive multi language text based fault warning and acknowledgement system. • Plug-and-go solution for the display of J1939 and J1587-transmitted engine and transmission data. • Compatible with most diesel engines and transmissions. • Large sunlight readable graphical display, 160 x 128 pixels. • Adjustable contrast and backlight. • Menu and text based alarm systems are in multiple languages. • Soft function tactile and audible push-keys. 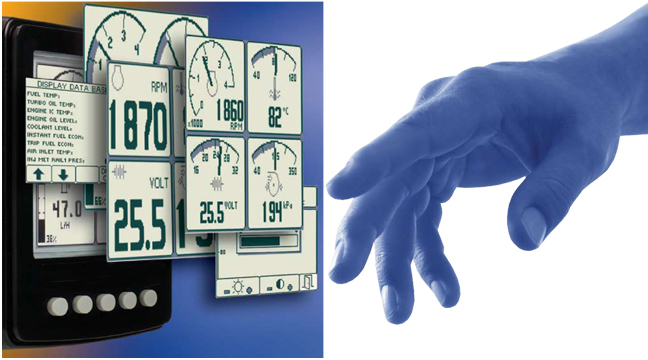 • Flexible display options: multi-window screens, with analogue gauge, digital text or graphs. • Data is available in several formats and measurement units. • Comprehensive fuel management and trip computer facilities. • Engine and transmission fault data is handled by a user warning and acknowledgement system. • Automatic last screen store and a keyboard lock. • A number of Engineering screens are available such as Comms and Message Database Viewers. • Alarm data and engine source filtering are user selectable. If supported by the ECU engine configuration data can be viewed. • Users are able to specify the engine service interval prompt and also the fuel tank capacity for fuel and distance to empty calculations. • Electrical connection to data and power lines is via a sealed Deutsch 12 way connector.